Mexico need only a point against Sweden to qualify and finish top. They will go through, irrespective of their own result, if Germany fail to beat South Korea. Sweden are guaranteed to qualify if they win or better Germany's result. They will top the group if they beat Mexico and better Germany's result. Germany will qualify if they win by two or more clear goals. If both Germany and Sweden draw their games, then the team in the higher-scoring game will finish second. If the matches finish with the same score, then Germany will finish second because they beat Sweden. South Korea can qualify if they beat Germany and Sweden lose, and finish with a better goal difference than those two teams. I had a feeling he would be at this one. 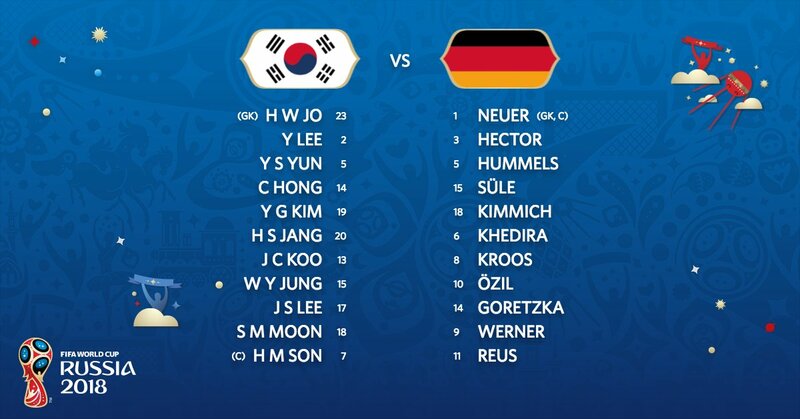 German corners and free kicks around the box likely to cause the Koreans some problems. I like the Korean strip, looks like a school gym kit. Think Elgin might have been onto something with the Colombian smuggling..
Chris Sutton: ‘he executed the pass well’. Pengey has seen a couple of shockers in a row. Well, that does put the cat amongst the pigeons... South Penge outdoing the might of both N Penge AND Spenge all on his own, what a guy!